Help create video documentation for trailer fabrication, in Spanish and English. To help (voluntary, but with eternal fame), please contact me. i've been designing carts that people can build in their communities for a low cost, with only basic fabrication skills and access to common tools. building and using carts can help facilitate a process of local community development. some folks extend that farther by starting community cart programs, in which a lot of people can use a few carts/bikes. the carts are built from metal conduit tubing and are brazed together using an oxy-acetylene torch. they take from 5 hours to 12 hours to make, depending on your familiarity with the fabrication techniques. they cost about $30 to build if you use new parts and salvaged wheels. car independence: we need to become independent from using our automobiles, for many reasons. cars are a problem because they support global industrial capitalism and the outsourcing of manufacturing to the people who are hurt the worst by industrialism. they also support militarization of oil-rich areas of the world for access to cheap energy. our use of cars releases greenhouse gases into the atmosphere, and burns dirty fuel in inefficient engines where the combustion byproducts poison humans, other organisms, and the land. additionally, the automobile paradigm takes us out of small centralized communities where we could work, live, and play, and spreads us out to the far reaches of sprawling development where we use our cars to go everywhere and isolate ourselves from our neighbors, local small businesses, and family. why bike carts? too often people complain that they would ride a bike except they can't carry what they need for work, that they can't bring their children, that they have to pick up a bag of potting soil that they couldn't possibly fit on their bike with the groceries...sound familiar? bike carts are a great solution, but most are expensive (for a cart that can haul 200 pounds, $300 to $500 USD). this cart weighs 30 pounds, costs $30 to build, and will carry more weight more securely than many commercial bike carts. it might even be able to carry larger items (like sofas or plywood, for example) than a car can carry. so this is a project about making bike carts, but it's also about finding a way to gain independence from our cars, build community by fabricating, playing, and biking together. reclaim transportation technology and empower ourselves by taking technology choices and development back into our own hands. the dominant car-based transport paradigm teaches us that to get around, we need to spend lots of money to buy something which is environmentally damaging. it teaches us that when something breaks, we need to take it into a shop, send away for parts, and pay lots of money, and eventually start all over again with a new car. you can't build them, fix them very easily, grow fuel for them (for the most part: read on ethanol and biodiesel), or use their parts after you're done with them in their original form. if we question cars, we learn that we can lessen our impact by buying a less-bad car (small car, hybrid, grease, biodiesel), and that less-bad is a fine way to be. make that choice for yourself. I became interested in bike carts after I saw two Bikes at Work trailers being used for trash and recycling pickup in Northampton, Massachusetts, by Pedal People. They are great trailers, but cost $400. This cart costs $30 in parts, is fun and educational, and is an opportunity to build community through both the fabrication and use of the carts. I would like to see community bike cart programs with user accountability. Imagine this: a group of people gets together, obtain some funding from the town for a community development project, and build a few bike carts. They advertise the program in the town/neighborhood, and offer the use of these carts to anyone. For a small deposit of money, barter equivalent, trust, etc, you get a key that unlocks the bike carts from wherever they are. You have designated locations where they live, where you might expect to find a cart. In this way, many people can use a few carts. The carts could either have designated bicycles, or you can attach the hitch to your bike when you get the cart. Or, you can build a hitch for your bike and leave it on all the time if you use the cart frequently. Should I put a recommended load weight limit on the cart? I guess so. I've successfully carried 300 pounds of people in these carts. Once, with a 300 pound load, one wheel potato-chipped while going on a sandy slope sideways. It was fine on flat ground. So if you carry 300 pounds, don't take the cart on a sideways slope. The wheels are the weakest part of the cart. Maybe a 200 pound load limit? It takes me about 8 hours to make a cart. It takes 1 hour to make the hitch. 2 hours is aligning and brazing the frame together. 1 hour is cutting, bending, and mitering the tubes, and the other 4 hours are for dealing with wheels, painting the joints, making the plywood bed, and other small details. The first time you make a cart will take much longer...maybe 15 hours. Balance the load just in front of the wheel axles, to keep a downward force on the hitch, but not too much. Try putting a lot of weight in the back as an experiment. It's not fun for long. Secure the load with straps, especially on bumpy roads. When pulling, don't go around corners too fast when the cart is empty, because it could flip over. Don't go around corners too fast when it's heavily loaded, because the sideways force on the wheels could cause them to buckle. Try not to jack-knife the trailer when backing up or taking sharp right turns because it could damage your bike or the hitch. there is a significant amount of embodied energy and chemicals involved in the fabrication of these trailers. the steel industry has a long history of chemical pollution and labor exploitation. i don't know what's in brazing flux (some flux has boron), or what the process of galvanization is like. brazing conduit releases zinc oxide and other chemicals. the paint used to protect the joints is dangerous, and paint cans have a disposal problem. recognizing all this, bicycle carts can replace a technology that is much more chemical, energy, and exploited-labor intensive: the automobile. the health benefits from transporting oneself by bike are significant. i encourage you to treat this project as an investment in an alternative to cars, and as such its usefulness will outweigh its social, environmental, and financial costs. this is an open source design. 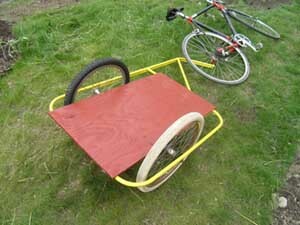 make a bike cart. use it. then make another one to give to a friend.